The blue Furok seems to be Tony's personal furok, from the comic strips in the Book of Ages to the preview animation done by Paul Neal for the now defunct first go Magi-Nation animation. The contestants in Keeper's Question were reminded of this fact and tried to capture this flavour for the card. 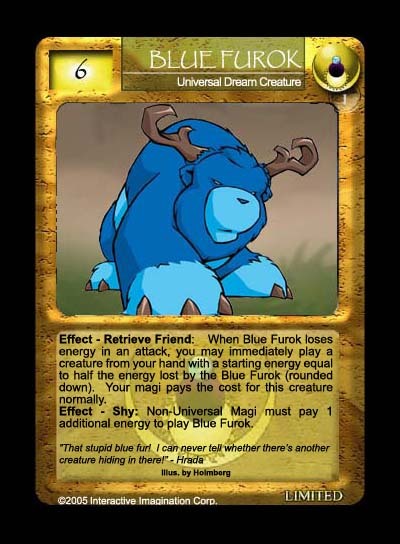 The most innovative entries have been amalgamated to become the card above, which combined the furok's retrieval with energy lost in attacks. It alsolimits the creature from being played by any non-Universal magi by adding a penalty, sort of like a reverse regional penalty.